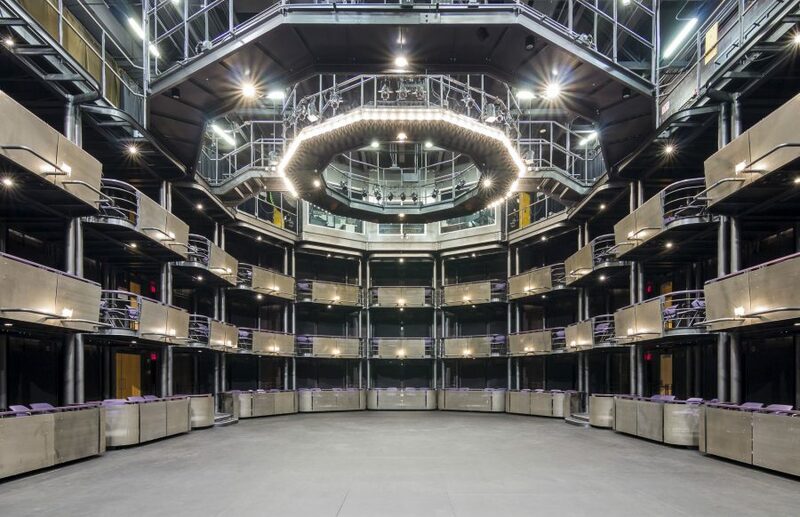 Innovative design leads to innovative thinking — and nowhere is that more true than at the Chan Centre’s Telus Studio Theatre, which was designed as an experimental space. With 12 tri-level towers that can be arranged in a host of configurations thanks to Boeing technology that allows them to “float” using compressed air, and a complex catwalk system that allows for endless rigging options, the room offers faculty and students from the UBC Department of Theatre and Film a host of creative possibilities. That flexibility has led to groundbreaking original productions, as well as inventive interpretations of Chekhov, Shakespeare, Euripides, and other classics. In a production of Medea, the title character noisily stormed around the catwalk, and when the House of Atreus fell, so did a 22-foot-high wall made of wood slats. In Romeo and Juliet, Tybalt launched his fight against the Montagues with a leap from one of the towers, and Friar Laurence spun fire. For faculty, the 150- to 250-seat theatre has proved an essential research arena where professors can explore how performance space affects the theatrical experience. For set and costume designers, it’s a laboratory that forces them to think outside conventional boxes. The unique configuration also pushes actors, who are surrounded by the towers, to think beyond a typical proscenium stage — and has them looking up, literally. “It’s truly dimensional, because you have people behind you as well as in front of you, and you inevitably have people above you — so there’s a different kind of consciousness that gets inspired in young actors,” says Stephen Heatley, head of the UBC’s Department of Theatre and Film, who jokingly describes the space as a cross-section between Deep Space Nine and a Georgian theatre.